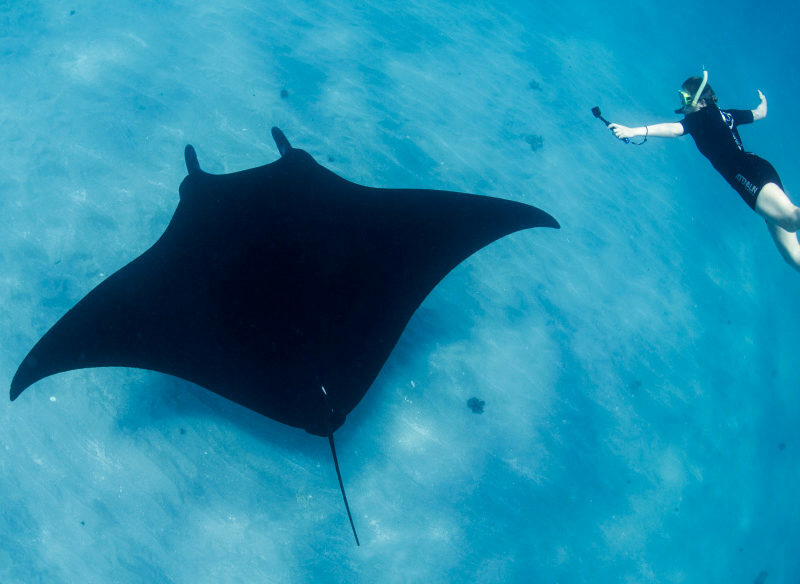 Glide along with the elegant manta rays. Australia is home to some of the most incredible wildlife in the world. On land, air and sea, here are our picks to encounter unique species, often found nowhere else in the world. We know you’ve seen the photos via the celebrities you follow on Instagram, but don’t worry, this extraordinary encounter isn’t just for VIPs. Mere mortals who visit the famous Australia Zoo can also have the chance to cuddle a koala, using the experience as a chance to chat with keepers about the conservation practices behind the iconic animal. The Australia Zoo is dedicated to wildlife, and works on a number of programs to ensure the maintenance of their high ethical standards. Three to four koala cuddling sessions run each day and we recommend bookings in advance to guarantee you a chance for a photo op. Prices start at $49 per person, and admission is not included. Just 90 minutes from Melbourne lives one of Australia’s largest penguin colonies. And like a fairy tale, every night at sunset, these tiny penguins emerge from the waters of Phillip Island and make their way back to their burrow. As this phenomenon occurs, visitors watch the magic from beachside seating and an underground viewing station. This wildlife experience is perfect for families and is particularly popular during school holiday periods. Prices start from $26.20 per adult for general viewing or $65.40 for a family pass (two adults, two children). Mon Repos Turtle Encounters offers a unique opportunity for visitors to catch a glimpse of a turtle’s world – at least for one night. Between November and January, attendees are given the opportunity to witness an ancient life cycle of the animal kingdom, as majestic sea turtles make their journey to the shore to lay their eggs. Alternatively, from January to March wander along the beach to watch one of nature’s most surreal experiences as hatching marine turtles make their way down the beach towards the sea. Tours take place each night between November and March however, rangers cannot guarantee that turtles will make an appearance each night (or that they will be on time!). Prices start from $12.40 per adult or $29.75 for a family of up to 4 people. Experience quokkas in their natural environment. Not only is Rottnest Island home to some of the most incredible beaches in the country… it’s also home to the happiest animal on Earth. The quokka is an incredibly friendly and curious inhabitant of the island, and very popular for its approachability. The adorable animals roam freely around the island, allowing you (and many celebs) the chance to snap that perfect #quokkaselfie. Among the lucky few to have perfected the pose include Hugh Jackman, Margot Robbie and Roger Federer. A quick stroll around Rottnest will usually result in a quokka spot, however FYI, they are nocturnal so are easiest to interact with later in the evening as they prefer to sleep during the day. Take in the Australian outback while trekking with camels on the historic Beltana Station – Australia’s oldest camel station. Choose between full day, overnight tours or three to 15 day treks where you can enjoy meals straight from the camp oven and alternate between walking alongside and riding their camel. You can also learn some camel husbandry skills to improve your encounter. Make sure to embrace the remote location and enjoy the digital detox this experience offers you. Full day tours start from $240. Three days/three nights start from $1460. Experience ‘Roar and Snore’ at Taronga Zoo, Sydney. Fancy a sleepover at one of Australia’s most beautiful zoos? Book a ‘roar and snore’ tent for the ultimate glamping and animal experience. Enjoy complimentary refreshments and a buffet-style dinner while taking in the stunning views of the Sydney Harbour before partaking in a private, guided, night-time tour of the zoo. After the evening activities comes the ultimate wildlife sleepover in a luxurious tent, with a continental breakfast in the morning. Adults mid-week from $275 and weekend from $345. At the world’s first ‘unzoo’, you’ll have the ability to join in the effort on a Devil Tracker Adventure experience. At this revolutionary sanctuary, animals are not locked in enclosures, and are instead allowed to roam a natural habitat and interact with the environment. Join the guided 4WD tour through the native bushland to identify and track the resident devils. Guests will also learn about the unzoo’s fight to preserve the species and how healthy devils live in isolation to prevent the spread of disease. Devil Tracker Adventure cost $110 per adult, $60 per child (children under eight not permitted) and $280 for a family of two adults and up to four children. Includes Unzoo entry. This sanctuary in the mountains of Tropical North Queensland houses close to 60 native and exotic birds in a rainforest habitat. Wander the paths of the enclosure at your leisure, taking the time to look up to spot as many of the birds as possible. Be sure to keep an eye out for the large and elusive cassowary, an icon of the region. Buy a bag of bird feed on you way in and don’t be surprised if some curious birds land on your shoulder for a snack. Entry to Birdworld Kuranda is $18 per adult, $9 per child (four to 15 years). While you’re in the area, make some time to stop at the Kuranda Koala Gardens. Here you’ll be able to look up and spot our native marsupial doing what they do best – eating, sleeping and looking adorable. Entry costs $19 per adult and $9.50 per child. Alternatively, purchase ‘Friends in the Rainforest’ ticket for $32 per adult and $16 per child for entry to both Birdworld and the Koala Gardens. It’s hard to think of an ultimate sea wildlife adventure without mentioning dolphins. At Tangalooma resort on Queensland’s Moreton Island, guests have the opportunity to meet the local bottlenose dolphin families that visit the shores each evening at sunset. Not only do you have the opportunity to feed them, but you can also pick the brains of the Dolphin Care Team experts, who are familiar with the regulars, each with their own distinctive and unique personalities. Tangalooma is careful to provide only 10 to 20 per cent of the dolphins’ daily food intake, helping to maintain their independence. It also takes many precautions to protect the dolphins from the possible dangers of human interaction. This jumping croc cruise down the Adelaide River might just be one of the scariest experiences of your life (if you consider getting up-close and personal with the world’s largest living reptile scary). During this wildlife adventure, a tour guide will take you down a private stretch of the river while dangling meat in front of the local crocodiles, encouraging them to jump up next to your boat. Not only will this allow you to get up-close and personal with the enormous crocodiles, it will also provide many excellent photo opportunities. Cruises cost $45 per adults, $25 per child (four to 15 years), $120 for families (two adults, two children). Western Australia’s Coral Coast provides the perfect backdrop for many incredible wildlife opportunities – one being the chance to swim, dive and snorkel with manta rays all year round. These gentle giants can often be found swimming in the waters just off the holiday towns of Coral Bay and Exmouth, and are even known to jump out of the water and perform acrobatic tricks. Tours depart from Coral Bay year round while tours from Exmouth depart between June and November. Prices start from $170 for a six-hour tour. Spend your day swimming with the ‘puppies of the sea’, watching as they jump, twist and flip in and out of the water. These endangered sea lions are particularly playful in their natural habitat, eager to put on a show for a boatload of audience members. Guests will be provided with a mask, snorkel, wetsuit and free photos. Price for an adult swim start at $205. Don’t let the name scare you – whale sharks are the biggest but gentlest of the shark family, making them an excellent snorkelling companion. Tours in the heritage-listed Ningaloo Reef Marine Park allow visitors to snorkel and dive with these enormous plankton eaters, while also enjoying everything this beautiful reef has to offer. A plane will fly overhead to spot any whale sharks, guiding your tour towards their location. And while on-board, marine biologists will provide information, taking the time to answer any questions you might have. At the end of your tour you will be given a video of your whale shark encounter. Departing from either Darling Harbour or Circular Quay, Sydneysiders can easily experience a dose of whale watching. Whale Watching Sydney does its best to identify the most active whale pods ahead of time, and may even switch locations during the tour to offer you the best experience possible. Expert commentary will be provided, plus photographers to do all the hard work for you. You just have to sit back and enjoy the action. Tours start from $65 per adult. Think you’re brave enough to experience Australia’s only crocodile dive? Well you’re in luck. At Crocosaurus Cove, you and a friend have the opportunity to be dangled above an enormous crocodile in ‘the cage of death’ before being submerged into the water. Regular feedings are conducted throughout the day to encourage movement, making for an even more terrifying encounter. The clear tube offers 360 degree views of the crocs and their enclosures while a professional photographer documents your experience. $260 for Cage of Death for two adults. It can be pretty difficult to spot a platypus in the wild, which makesthis encounter all the more special. Thanks to the Healesville Sanctuary, you and a friend can hop into the platypus pool for a cuddle, tickle and feed with the help of a trained animal keeper. Pretty special, huh? Encounters start from $182 per person which excludes general admission.